On February 5, 2018, Mr. Bernard Dewit, Chairman of BCECC met with Mr. Zhang Ming, Ambassador of the Mission of China to the EU and Mr. Eduardo Santander, CEO of the European Travel Commission (ETC). 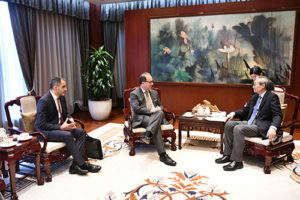 Mr. Dewit and Mr. Santander were received by Ambassador Zhang Ming and briefed on the 19th National Congress of the Communist Party of China, with emphasize on the bright prospects and huge potential for EU-China commercial and tourism cooperation as China further opens up. The BCECC strives to play an important role to further advance China-Europe cooperation. Mr. Dewit then discussed further topics on EU-China commercial and tourism cooperation with the Ambassador and Mr. Santander.